(CNN) -- The Sony Corp. announced net losses of $1 billion for the fiscal year ending March 31, ending a year in the red for the first time in 14 years. 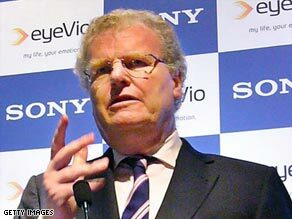 Sony Chairman and CEO Howard Stringer took over direct supervision of the electronics division. The company announced plans to reduce plants worldwide to 49 from 57, including four factories in Japan. The factory closures are in addition to 8000 job cuts previously announced. The loss comes just months after Sony Chairman and CEO Howard Stringer took over as company president to take its troubled electronic products division directly under his wing. Sony, once the iconic maker of the Walkman, has seen it lose ground to popular devices such as Apple's iPod. Still, Sony's year-end losses were less than many analysts had predicted. Japanese firms have been hit hard by the credit crisis. Although few banks were directly affected by collateralized debt or other "toxic assets" that have crippled Wall Street and U.S. corporations, Japan is highly dependent on exports to markets that are most affected by the crisis. The International Monetary Fund predicts the Japanese economy will shrink by 6.8 percent this year, the largest of developed economies.